$16.334 million on 3065 screens. In a movie universe dominated by material aimed at younger audiences, can a tale about four geezers on vacation score at the box office? Based on the reception accorded 2013’s Last Vegas, the answer becomes a resounding “maybe”. Vegas took in $60 million, which seems decent, but it broke no records. With a stellar cast and a potentially fun premise, I thought Vegas deserved a look. A prologue set in 1955 introduces us to adolescent pals dubbed “The Flatbush Four”. We quickly leap ahead to modern times to encounter the “Four” as elderly men. Sam (Kevin Kline) lives in a retirement home in Florida, while Archie (Morgan Freeman) resides with his extended family – including son Ezra (Michael Ealy) - in Engleside, New Jersey. Over in Brooklyn, Paddy (Robert De Niro) mourns the loss of his wife Sophie - who died a year earlier - and he usually refuses to leave his apartment. Finally, we get to Billy (Michael Douglas), a resident of Malibu, California and a lifelong bachelor. Billy still tries to act like a stallion, which means he sports a much, much younger girlfriend named Lisa (Bre Blair). After the passing of his “mentor”, Billy fears dying alone, so he proposes to Lisa. She accepts, and to celebrate his upcoming nuptials, he reunites the “Flatbush Four” for one final fling in Las Vegas. We follow their exploits – and character arcs – during this vacation. Vegas sells itself via one major asset: its cast. All four of our leads have won acting Oscars, as has Mary Steenburgen, who turns up in a supporting part. Many films use cast members to sell tickets, of course, but that becomes an even more dominant aspect of Vegas, as its roster seems virtually irresistible – at least for movie-goers of a certain age. Whatever charms the film boasts stem solely from its actors. Mix the four leads and even a remake of Mac and Me would merit attention. It’s simply fun to see these guys bounce off of each other, and this gets a boost because they seem to enjoy themselves; none of them stretches his legs, but they all appear to have a good time, and that energy occasionally turns contagious. 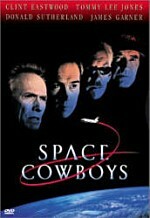 But only occasionally, as the movie’s flaws weigh down the strengths of its cast. To call the flick predictable would be an understatement. Viagra jokes will multiply, youngsters will be put in their place, and vitality will be recaptured. If anything creative or fresh pops up here, I can’t think of it; this remains trite, tedious material much of the time. I hesitate to credit the film with an actual plot, as it really just consists of a long series of story elements connected by a loose theme. Hijinks ensue and moments of drama periodically pop up, mainly due to a contrived spat between Paddy and Billy, but nothing much results from all this. Face it: the “plot” exists as an excuse to get some older actors together and have them live it up. As noted, that occasionally suffices, but not often enough to make Vegas particularly entertaining. The star power of its cast keeps us with it for its first act or so, but after that, the absence of clear story or character elements harpoons it. Such a talented cast deserves better than this tiresome snoozer. 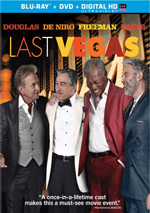 Last Vegas appears in an aspect ratio of approximately 2.40:1 on this Blu-ray Disc. This was a nice visual presentation. In terms of colors, the movie featured a natural palette that favored a golden tone. Across the board, the hues looked positive. They showed nice clarity and breadth and came out well. Blacks were dark and deep, while shadows appeared clear and smooth. I thought the movie consistently looked great. I thought that the DTS-HD MA 5.1 soundtrack of Vegas seemed fine but it didn’t excel because of a lack of ambition. Like most comedies, the movie featured a limited soundfield that strongly favored the forward channels. It showed nice stereo spread to the music as well as some general ambience from the sides. Panning was decent, and the surrounds usually kicked in basic reinforcement. A few scenes opened up better, though, like at casinos, airports or parties. However, most of the movie stayed with limited imaging. When we shift to extras, we begin with an audio commentary from director Jon Turteltaub and screenwriter Dan Fogelman. Both sit together for this running, screen-specific look at story/character areas, cast and performances, sets and locations, music and costumes, editing and deleted/altered scenes, challenges shooting in Vegas, and a few other areas. A veteran of commentaries, Turteltaub feels at ease with the format and dominates the chat; a newcomer to the experience, Fogelman chimes in occasionally but remains the minority partner. Which is fine, as Turteltaub gives us a winning look at his film. The track covers all the appropriate bases and does so in a light, charming way that makes it a good listen. We also find six brief featurettes. These include “It’s Going to Be Legendary” (3:14), “Shooting in Sin City” (2:48), “Four Legends” (2:58), “The Redfoo Party” (1:50), “The Flatbush Four” (1:37) and “Supporting Ensemble” (2:21). Across these, we hear from Turteltaub, producers Amy Baer and Laurence Mark, and actors Morgan Freeman, Robert De Niro, Michael Douglas, Kevin Kline, Redfoo, Mary Steenburgen, Patrice Hollis, Christine Smith, Romany Malco, Curtis Jackson and Jerry Ferrara. The segments cover cast, characters and performances, sets and locations, and some scene specifics. The pieces exist solely to promote the film, so they come with little informational value. Kline can be funny but that’s the only real positive I can attach to these featurettes. The disc opens with ads for Blue Jasmine, Bad Country, and Captain Phillips. These also appear under Previews along with clips for Cold Comes the Night and Inside Llewyn Davis. No trailer for Vegas shows up here. A second disc gives us a DVD Copy of Vegas. It includes the commentary and three of the six featurettes; it omits “Shooting”, “Redfoo” and “Ensemble”. As much fun as it can be to watch the film’s famous actors interact, Last Vegas lacks anything else to bring it to life. The performers keep us engaged for a while but they can’t redeem the banal nature of the project. The Blu-ray provides excellent visuals, decent audio and a good commentary. The movie’s legends make it occasionally interesting but they’re not enough to carry 105 minutes of tedium.